I know, I know. These photo’s are far from professional. They were taken well before I realized that I would actually (finally) create this blog. Excuses made, you may now proceed to the pattern without giggling too much at my low-budget photos. I made this pair of longies out of acrylic yarn. To use them as longies (and not just trousers), however, you will need to use wool as it can be lanolized to act as a diaper cover for cloth nappies. It also breathes better and is flame resistant! Here are the patterns and measurements from 0-3 months all the way through to 24-36 months. If your child falls between these measurements or only one of them seems to be right for you, I would suggest going with the hips, because both the rise and the inseam are easy enough to alter yourself whereas the hips are a bit more tricky because of the increases for the gusset. The following suggestions are based on the specified gauge, which is 18 rows and 17 st’s per 10cm square. To lengthen or shorten your RISE, add or remove one row for every centimetre. This will add or subtract roughly 5mm from the front AND the back, giving you approximately 1cm more or less in total. To lengthen or shorten the INSEAM, add or remove 2 rows for every centimetre. The same applies to the HIPS, where adding or subtracting 2 stitches will give you more or less a 1cm difference. This will give you 1 stitch more or less per leg as well. Click on the relevant link below to download your pattern. Just made these for my 4 yo.I did however knit the band and crocheted the rest.They are so cute.Thank you. Oh what a good idea! A Knit band would be so much better. Hello. Im doing the 18 to 24 month and the pattern goes from row 38 to 43. Im not sure where row 39 to 42 are. Hi Krislyn. Row 5 says to repeat the instructions for a total of 38 rounds, of which 5 is the first and 42 is the last. It’s not the best of pattern writing, I agree, and does need revisiting. Basically, you make a sc in each st of Round 5 and then each st of the next 37 rounds, bringing you to 42. Then you continue to 43. Just started on the 2nd leg but it looks like somehow it’s looking different like the right side for the top and 1 leg is right side and the left now I have started looks like it is the wrong side. Not sure how I have managed this so I am going to rip out what I have done and try again. Any suggestions?? Hi Laura. I’m sorry to hear that you are having trouble with this. When you made the top and the right leg, were you always working on the side of the tube closest to you? If you were, the right side would have been facing out. When you attached your yarn for the other leg, was it possible that you started working on the side of the tube farthest away from you, which would have meant that you were working with the right side facing in? This is the only reason I can think of for one side being right-sided and one side being wrong-sided. You should always work on the side of the tube closest to you. Hi Dedri. I am trying to make longies for my first, who is expected March 2017. I am not sure how many deletions I should make in order for it to fit a newborn. I read your post and looked over the pattern and I think the numbers still need to be adjusted for the smaller size? Can you help me with the math? Newborn sizes are very tricky because newborns can vary so much. My boys were all under 7 pounds, so they were tiny, but my friend’s son was 11 pounds so fit in 0-3 month items. To work out how many deletions you would need, I would need to know the measurements of your baby, which is why I haven’t supplied a newborn size. There are plenty of other free newborn leggings patterns on Ravelry, though, so maybe one of them would be better suited? I hope you find one you like and good luck with the rest of your pregnancy and delivery! I haven’t been crocheting very long and I’m still getting use to reading patterns and types of wool, can I use a 8 ply wool for this? You can, as long as it is dk weight (light worsted weight # 3). In Australia 8 ply doesn’t refer to the ply as much as the weight. Bendigo 8 ply, for example is worsted weight made using 8 plies, which won’t be suitable. Hi Dedri, would you possibly have any idea as to how many skeins I would need for an 18-24 month size pattern? Ashley, unfortunately I do not. These patterns were some of my first and they need serious updating as to yardage. I estimate that you will need just under 300 g of light worsted weight yarn (#3). I hope that helps. Hi, ty for sharing your pattern. If you do not have time to answer I understand. 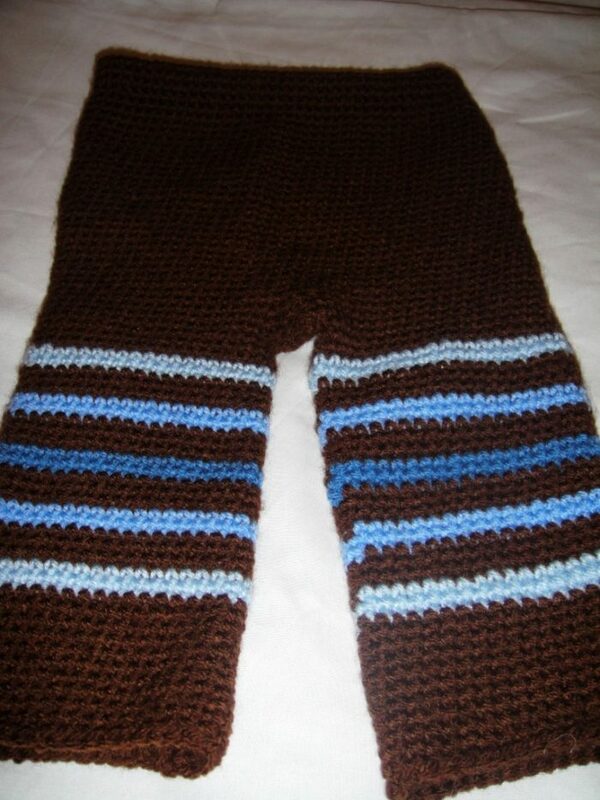 i want to make these for my grandbabies. I will be using 3 colors. I know this sounds really really stupid, but when I crochet 93 ch, what am I making? is it 1 side, or top to bottom. I have read it several times I am having some kind of a block and just not figuring out when I need to do changes… I am so sorry to bother you with this. I live with a condition call ed RSD, reflex sympathetic dystrophy, sometimes it is very hard to concentrate when living in so much pain, and this winter has been tough. i blame my stupidity onto my pain . When you chain the initial chain it will form the whole top of the longies. You are working top to bottom. The first 4 rows will form the seam into which you will feed your elastic, so they are worked backwards and forwards. In Round 5 you will start working in a spiral for however many rounds are specified in the instructions for Round 5, and then you will continue on. The patterns are in dire need of an update. I can only apologize and say that I will make work of it soon. 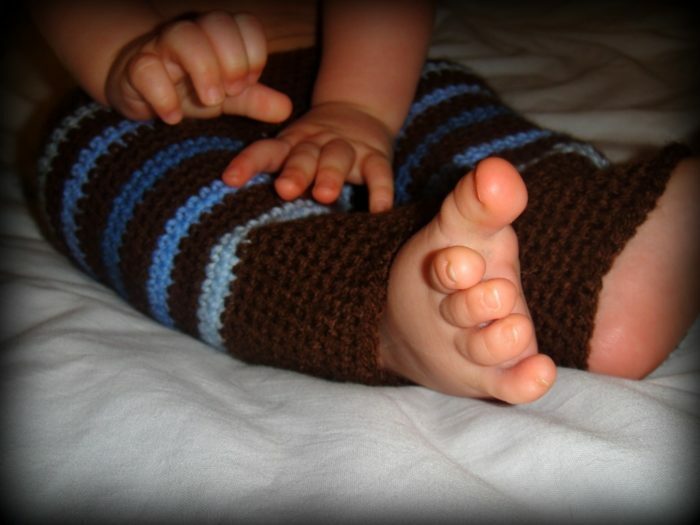 I cant wait to make these, my 6th grandbaby is coming in Feb 2015, so I think I will make 9-12 mos size so they will fit the first Christmas (and at the rate I am getting so many projects I want to do, it will take e that long! )- I am going to try a Sock Monkey colorway I have seen, so keeping my fingers crossed! Good luck :) A lot of people have found them to be quite large, so make sure that you are happy with the size before getting too far into the pattern. Hi, if you read through round/row 5, you will notice that the pattern indicates how many times you need to repeat that specific row. For the 0 – 3 month size, for example, you are told to sc in each st around for a total of 32 rounds. I have worst weight yarn, medium 4 weight it says to use a size 5 needle. If I adjust my needle to match you gauge will the longies still turn out to work with the sizing you suggest? They will, Sierra, but you will have a hard time matching the gauge if you use worsted weight. I would suggest going down a size (at least) if you are going to use worsted weight yarn and a 5 mm hook. If you work up a gauge swatch and tell me which size you are after, I will tell you which pattern to use. Hello! 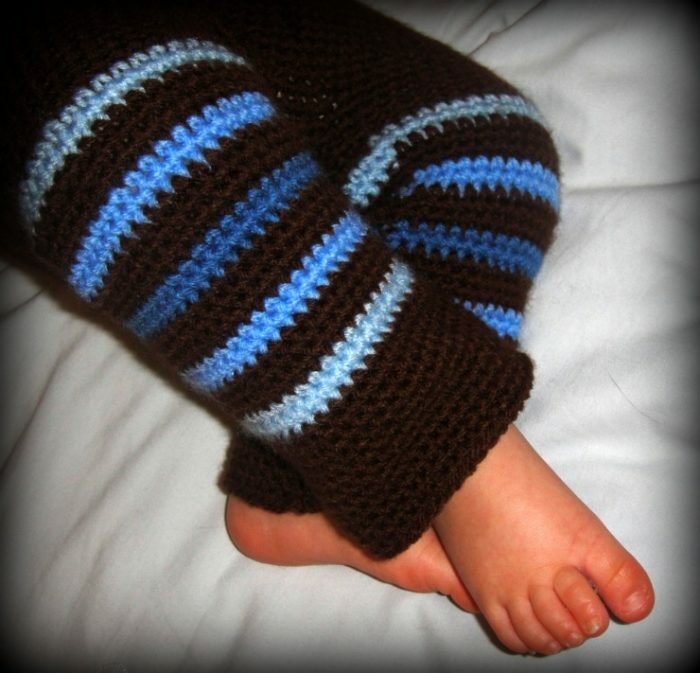 I found your pattern on Ravelry and I’m just wondering if WAHMs are allowed to sell items made from your patterns? Sorry if this may have been asked before. I may have missed something in the comments. I’m so glad i found this page i’ve been wanting to make leggings for my lil one for so long!! I tried downloading the pdfs for all sizes but it isnt downloading keeps saying error? Are the no longer useable? Marina, have you checked your internet settings? They might be blocking the pdf’s from downloading. I have checked the links and they work for me. If you still have problems, please contact me again. I’m trying to make the size 18-24 and it is starting out big. I’m using acrylic yarn as well. Any pointers? Like I mentioned to you in the email, Steph, check that you are using light worsted weight/#3/double knit yarn, work up a gauge square to ascertain if you need to drop a hook size, check the measurements in the table to see if they are right for your specific “customer”. I do think the suggested sizes are bigger than the average child of each particular age. If you think that a 12 – 18 month pattern’s measurements will fit your child better, then go for that instead. This is such an AWESOME pattern. I’m making them for my Grandson. He’s 2& goes nuts pulling all my yarn ok.
Regina, do you mean in Row 2? You work into one loop only of each of the ch st’s. It doesn’t matter if it is the top loop or the back bump, although working into the top loop will give you a bit more elasticity. Yes Dedri. I just wanted to confirm that there wasn’t a specific loop. Front or Back post SC. The pattern is worked in both loops, Regina. Just good old regular single crochet. It is only the second row that is worked into one loop only of the chain stitches. 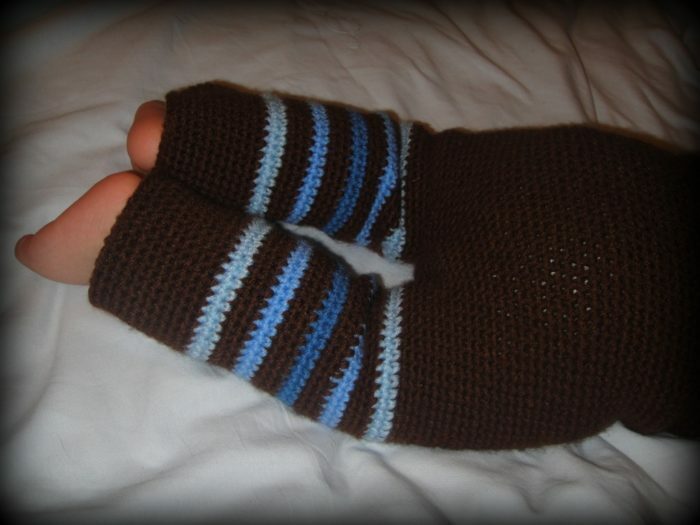 I know this is going to seem like a strange request, but my sister (having seen the longies I knitted for my sons) wants me to make her a pair! It’s a bit of a challenge as she has an 87cm inside leg, so I figured a crocheted pair would be quicker. I love your pattern and am trying to convert it to fir her! Would you mind checking my maths for me, please? Rise 78cm, Hips 102cm, Inseam 87cm… Row 1: chain 173. Increase to 208sts by row 80 then split for legs. Add 114 rows for legs. Right. That’s quite a tall order…hehe. Provided you use the hook/yarn/gauge provided, your sums seem accurate to me. As I don’t know which size pattern you used, I’m not sure how many rows adding 114 for the legs would add up to. This is what I got: 173 st’s to start. Sc as per pattern for 70-75 rows/rounds. Increase by 4 each for another 5 rounds (you might need another increase round as grown-up groins are a different kettle of fish!). Also, if her legs are super skinny or super bulky, You might need to add more increases to make sure you have enough st’s to go around each leg. Work legs for a total of 156 rows. This seems like a HUGE undertaking :) I suggest fitting the longies on her when you get to the end of the increase rounds. Pinch it between her legs (as if they were french knickers) and see if you have worked enough increase rounds to allow for upper thigh size. This will also give you an idea of if your rise length is correct. You’ll be gutted if you find out at the very end that the rise wasn’t right. Best of luck and please pretty please keep me informed. I would love to see a grown-up pair of longies! I’m mot understanding how you make the “tube” for round 5 and the waistband. Can you help me please?? Hi Ashley. When you get to the end of the row, make the first stitch of your next round in the stitch farthest away from your hook, not the one closest to it (so the first stitch of the previous row, not the last one). This will give you a circle. Just continue working each round in a spiral from this point on. Hope that makes more sense. I just made some longies using your pattern and they turned out awesome! Thanks for the pattern!